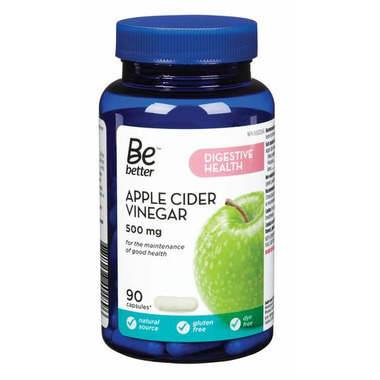 The Be Better Apple Cider Vinegar is a natural, gluten free, and dye free supplement that helps with the maintenance of overall good health. Other Ingredients: Gelatin capsule (gelatin, purified water), magnesium stearate. Dosage: 1–2 capsules, 3 times daily, preferably with plenty of water, or as recommended by a physician. These are great, price is good and liked the quality. I prefer to take apple cider vinegar as a tablet because the liquid burn my throat. This makes it easy to get a larger dose. I find all apple cider vinegars are the same so far (I've tried about 5 brands so far, I just buy what's available) but I like this one because of the price and that there are no unnecessary fillers. A great ACV choice!